Today marks the tenth anniversary of the publication in the Masterpiece section of the Wall Street Journal of my interpretation of Giorgione's Tempest as The Rest on the Flight into Egypt. The editor gave it the equivocal headline, "A Renaissance Mystery Solved?" I reproduce the brief essay below while a larger and more recent interpretation can be found at my website, MyGiorgione. I cannot say that my interpretation has taken the world by storm. I've sent it to most of the leading scholars in the field and only a handful have had the courtesy to even reply or acknowledge receipt. Academic publications have turned it down but I did get a chance to read it at the annual meeting of the Renaissance Society of America held in Venice in 2010, the five hundredth anniversary of Giorgione's death. It was a huge conference but only about fifteen people turned up to hear a paper by an unknown independent scholar. The experience in Venice led me to turn to the web as a means of publishing my work. I created MYGiorgione as an archive, and then began, with the great help of my late friend, Hasan Niyazi, to create this blog which by last month has received over 250000 page views. 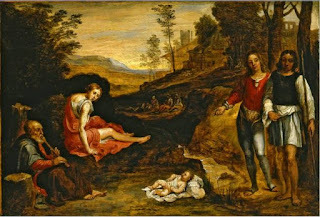 The website contains subsequent discoveries like my interpretation of Giorgione's Three Ages of Man as The Encounter of Jesus with the Rich Young Man; Titian's Sacred and Profane Love as The Conversion of Mary Magdalen, and Titian's Pastoral Concert as his Homage to the Recently Deceased Giorgione. A Renaissance Mystery Solved?, Wall St. Journal, May 13, 2016. “In the Age of Giorgione”, the exhibition currently at the Royal Academy of the Arts in London, has generated much discussion about the attribution of many of the paintings on display. Giorgione, in particular, never signed his work, and there is little documentary evidence given his early death in 1510 at about the age of 33. The London Review of Books recently featured a long review of the exhibition by renowned art historian Charles Hope. Hope entered the attribution debate and argued that less than half the paintings in the exhibition have certain attributions. In particular, as he has done in the past, Hope questioned the attributions of many paintings usually given to Giorgione, the star of the show. Hope went so far as to suggest that since only a handful of paintings can definitely be attributed to the young master from Castelfranco, it is almost impossible to assess Giorgione’s impact on the Venetian Renaissance. In a footnote the editor of Michiel’s notes provided a fuller description of the Discovery of Paris from a manuscript catalogue of the mid-seventeenth century. What are we to make of these three landscapes with figures in the foreground? What do they tell us about Giorgione and his age? Anyone familiar with the Venetian Renaissance would know that there has never been any agreement about the subject of the Tempest. An incredible number of interpretations have been put forward and all have been shot down. Hardly anyone accepts Michiel’s description of the man and woman in the painting as a soldier and a gypsy. Scholars are also divided about the subject of the Three Philosophers. Before the discovery of Michiel’s notes in 1800, the three men in the painting were regarded as the Three Magi, but Michiel’s description has not only given the painting its current name, but also has sent scholars searching for the particular philosophers represented. Today, it would appear that the Magi are making a comeback. However, there has never been any disagreement on the subject of the Discovery of Paris. Scholars have been unanimous in accepting Michiel’s description although they usually prefer the “discovery” or “finding” of Paris, rather than the “birth” of the Trojan prince. In my interpretation of the Tempest as The Rest on the Flight into Egypt, I included a discussion of the so-called Discovery of Paris in which I argued that the unanimous opinion of art historians was wrong. The painting bears little resemblance to the mythological story of the birth of Paris, but is almost a literal depiction of one of the popular apocryphal legends of the time: the encounter of the Holy Family with robbers on the Flight into Egypt. 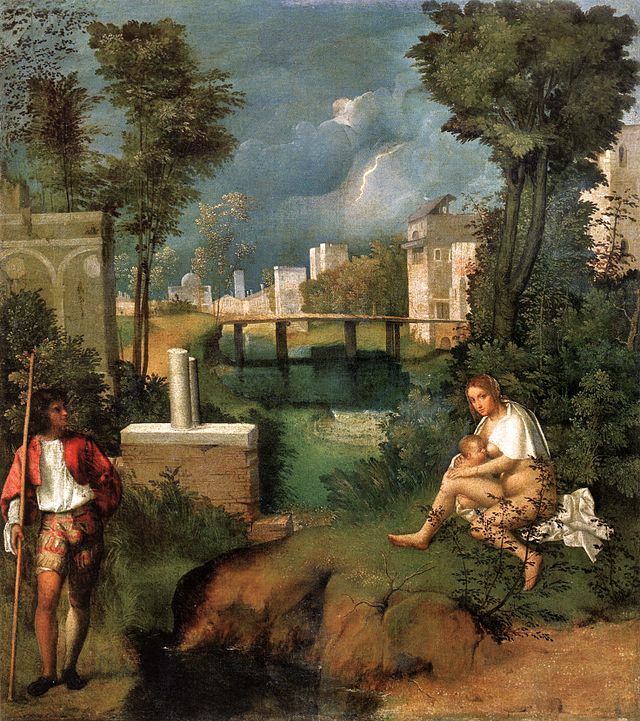 The interpretations of the Tempest and the Discovery of Paris may be found at my website, MyGiorgione. Here I just offer a short passage from the Arabic Gospel of the Infancy. The painting is a night scene with the sun setting in the background. The band of robbers is shown sleeping in the mid-ground. In the foreground there is an old man playing a pipe, a reclining woman with arms and leg exposed, and an infant lying on the ground upon a white cloth. To the right are two men whose clothing is in disarray. One of the men has obviously removed his “girdle”, and given it to the other who is wrapping it around his waist. All of these details are explained in my paper and they indicate that the Discovery of Paris has a sacred subject. If so, not only are all previous opinions fanciful, but also the conclusions drawn from the painting about Giorgione and his age are also fanciful. Although not as famous as the Tempest and the Three Philosophers, scholars have attached great importance to the lost Giorgione painting. 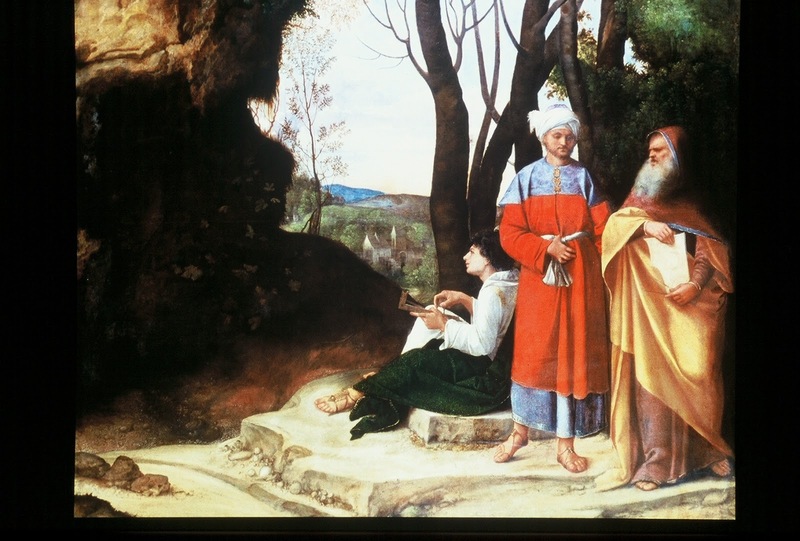 In an essay in the Frick Museum’s recent exhaustive study of Giovanni Bellini’s St. Francis in the Desert, Susannah Rutherglen examined the actual manuscript of Michiel’s notes and discovered that the Discovery of Paris and the St. Francis were not only in the home of Venetian patrician Taddeo Contarini but that they were hung together in the same private inner room. Rutherglen puzzled over the incongruity of an obviously devotional work like the St. Francis next to a painting of a scene from ancient mythology, and came up with a fanciful conclusion. 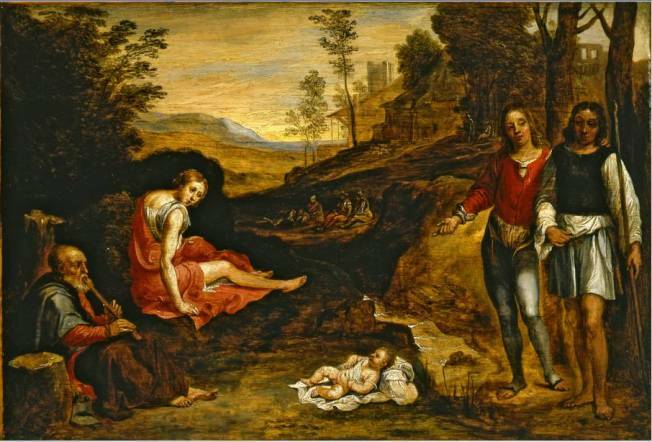 Rutherglen was following in the footsteps of Enrico dal Pozzolo, a Giorgione specialist, who attached great importance to the Discovery of Paris and another lost Giorgione, described by Michiel as “Aeneas and Anchises”. If it actually is the Child Jesus “placed at the centre of the scene"in Giorgione’s lost painting, what conclusions should we draw? The interpretation would then lend weight to those who believe that the Three Philosophers is a depiction of the Three Magi when they first beheld the Star of Bethlehem, another apocryphal legend. Both would then lend weight to my interpretation of the Tempest as Giorgione’s idiosyncratic depiction of the traditional and popular story of the Rest of the Holy Family on the Flight into Egypt. *The Anonimo, Notes on Pictures and Works of Art in Italy made by an Anonymous Writer in the Sixteenth Century: ed. By George C. Williamson, London, 1903. All references to Michiel are from this edition of his notes with page numbers in parentheses. **Extract from the Arabic Infancy Gospel in Edgar Hennecke, New Testament Apocrypha, edited by Wilhelm Schneemelcher, English translation edited by R. McL. Wilson, Volume One, Philadelphia 1963. p. 408. On the web a search for the First Gospel of the Infancy of Jesus, Chapter. VIII, will give the story with slightly different wording. ***Susannah Rutherglen and Charlotte Hale: In a New Light, Giovanni Bellini’s St. Francis in the Desert. The Frick Collection. New York, 2015, p. 56. # Enrico Maria dal Pozzolo: Giorgione, Milan, 2009, p. 264.